4-piece line-up including caller. Larger line-ups available. Perform for 2 hours over 5 hour stay. Recorded music in breaks. 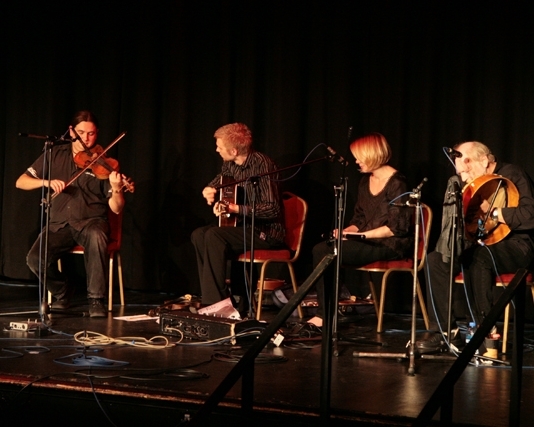 Since their formation in 2006, Triskel have gained a reputation as one of the leading Celtic bands in the south of England, with a vast repertoire of tunes and songs all with original instrumental arrangements. The group is led by Mal Simms, who plays guitar, bodhran, whistle and sings. 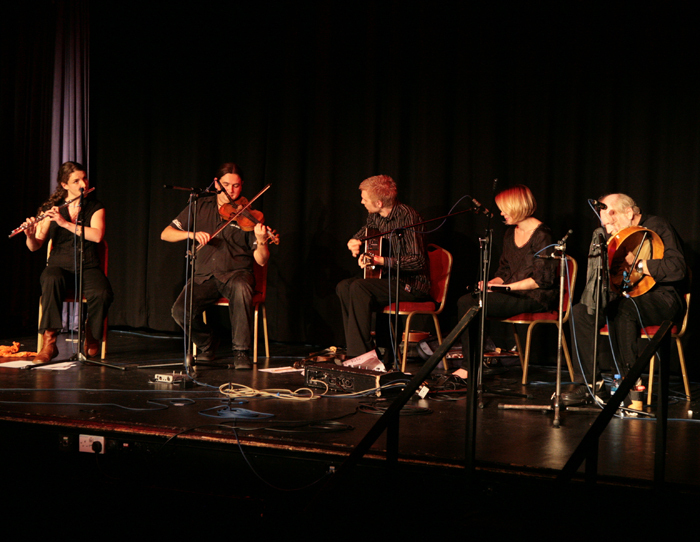 The other members of the five-piece line-up (as on their demo tracks and in the photo) are Tim (fiddle/mandolin), Alex (fiddle/guitar/melodeon), Sarah (flute/whistle/guitar) and Val (concertina, bouzouki, whistle and vocals). For dancing at weddings and parties, our recommended line-up is four musicians with one of them also acting as the band’s caller, who is skilled at guiding even the least experienced of your guests through English, Scottish and Irish dances. Unless otherwise stated we will quote for this four-piece line-up. 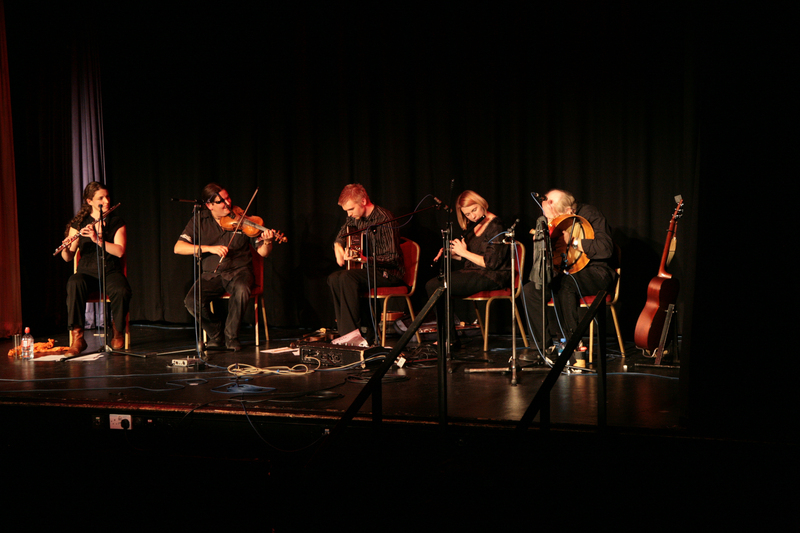 The band’s repertoire ranges from wild Irish jigs to plaintive Scottish airs, from rousing choruses and shanties to moving ballads and popular English folk tunes. They have played at numerous weddings and private functions, at venues ranging from village halls to country house hotels. Our CD also features some of the band’s non-dancing tunes – very welcome when your guests need a well-earned rest! The band normally play for about two hours. Triskel provides its own full PA system and if requested can also play CDs through their PA system during breaks. Triskel is based in Sussex. See Pricing for details of travel costs, etc. "We just wanted to say that we really liked our wedding band - Triskel, they made sure everyone had a really fun night and also played the various requests I had made. Thank you." "Triskel were brilliant! Thank you"
"Please would you pass on our thanks to Triskel for our Saturday event the band were great - everyone complimented them, the caller, albeit diminutive, was ace at disciplining everyone and keeping people in order and we had a fabulous party – thank you"
"Please pass on my thanks to the band - so many people have said how brilliant they were, and the number of people they got up dancing is a testament to this. They were super!" "Things were running very late so they only got 1 hour to play but we had about 90 people on the dance floor for the 1st dance and everyone had a great time"
"The band were very discreet about setting up - did not interrupt our reception even though venue was relatively small! Thank you"
"Absolutely fantastic! The band were so friendly and helpful. They helped make our party a fantastic success."